South African persimmons are the fruit of the jackalberry tree, which is found throughout Africa from Senegal and the Sudan to Mamibia and into northern Transvaal. Commonly found on the savannahs where it thrives growing on termite mounds, jackalberry tree fruit is eaten by many African tribal people as well as numerous animals, amongst these, the jackal, the tree’s namesake. An integral part of the savannah ecosystem, is it possible to grow jackalberry persimmon trees here? 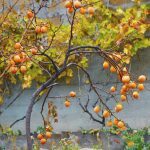 Read on to find out how to grow an African persimmon and other information on jackalberry persimmon trees. African persimmon, or jackalberry persimmon trees (Diospyros mespiliformis), are also sometimes referred to as African ebony. This is due to their renowned dense, fine-grain, dark wood color. Ebony is prized for use in the making of musical instruments, such as pianos and violins, and wood carvings. This heartwood is very hard, heavy and strong – and is resistant to the termites it’s surrounded by. For this reason, ebony is also prized for use in floors and high quality furniture. Native Africans use the wood to carve out canoes, but a more important use is medicinal. The leaves, bark and roots contain tannin that acts as coagulant to help stop bleeding. It is also purported to have antibiotic properties and is used to treat parasites, dysentery, fever and even leprosy. Trees can grow up to 80 feet in height but are more often around 15-18 feet high. The trunk grows straight with a spreading canopy. The bark is dark brown on young trees and turns grey as the tree ages. 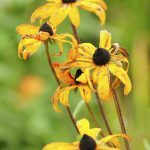 Leaves are elliptical, up to 5 inches long and 3 inches across with a slight wavy edge. Young twigs and leaves are covered with fine hairs. When young, the trees retain their leaves, but as they get older, the leaves are shed in the spring. New growth emerges from June to October and is pinkish, orange or red. The flowers of the jackalberry are small but fragrant with separate genders growing on different trees. Male flowers grow in clusters, while females grow from a single, hairy stalk. The trees bloom during the rainy season and then the female trees fruit during the dry season. Jackalberry tree fruit is oval to round, an inch across and yellow to yellow-green. The outer skin is tough but inside the flesh is chalky in consistency with a lemony, sweet taste. Fruit is eaten fresh or preserved, dried and ground into flour or made into alcoholic beverages. All interesting, but I digress. We wanted to find out how to grow an African persimmon. As mentioned, jackalberry trees are found on the African savannah, often out of a termite mound, but they are also commonly found along river beds and swampy areas. The tree is fairly drought tolerant, although it prefers moist soil. Growing a jackalberry tree here is suitable to zone 9b. The tree needs a full sun exposure, rich, moist soil. You are unlikely to find the tree at the local nursery; however, I did see some online sites. Interesting to note, the jackalberry apparently makes an excellent bonsai or container plant, which would extend its growing region.